The first entry in my 2018 Dirtbag Challenge build journal ended with a description of my ever-growing pile of parts, and touched on the conversations that precipitated Project SnoMoChop, one of them leading to the unconventional fork swap. While the part numbers and cursory measurements told me the swap would work, one never really knows until the fasteners get turned. 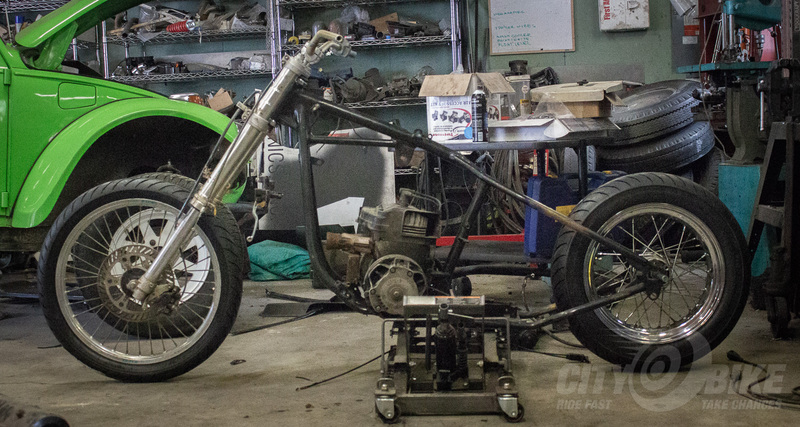 When I walked away last time, just over a week ago, I had temporarily situated the engine in the frame and spent a few minutes measuring the potential front end in an attempt to calculate the stance of the bike. With the snowmobile engine’s massive CVT assembly hanging off the left side of the bike, ground clearance is a real concern. But since I have the luxury of building from the ground up, my next logical move was to get the chassis into actual riding position. 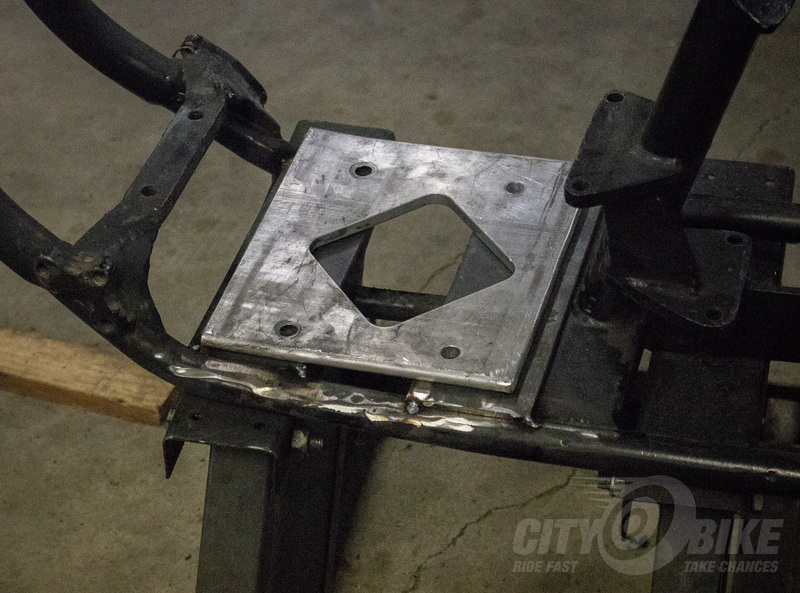 The only thing standing in the way of installing the front end was a pair of cups that hold the outer bearing races. I’d previously contacted one of CityBike’s go-to facilitators, Tony at SF Moto, to source tires for my project. While I was in The City, I stopped at California Choppers to see if a set of the required cups were lying around. California Choppers is quite an establishment, with an extensive, comprehensive back stock of Harley parts that’s truly unrivaled. I’ve called on them before in times of FXR need. My latest parts trip set me back $260: $60 for the cups, and $200 for a set of Avon Road Rider AM26s. With all the money I’ve spent so far—with still just over a month to Dirtbag weekend—I’m thankful I got the engine and front end for free. Back at home, a couple taps from a hammer and the neck cups were seated. 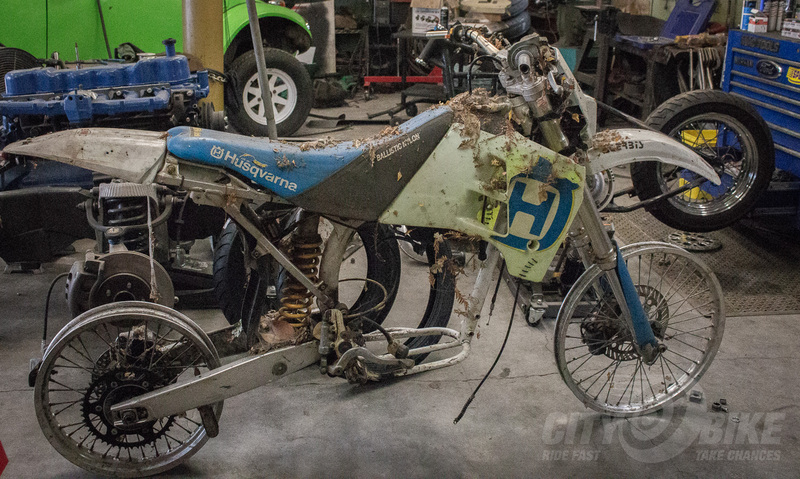 The next step was to strip the forks from the Husky. My mostly car-specific shop required some improv work to support the Husky while I removed the fork. I carefully removed the Baja Designs dual-sport kit, as that may come in useful later. Wiring stripped and clutch lever discarded, the front end came off without much of a struggle. The moment of truth… I slid the Husky fork home in the Harley frame. There was no struggle, and this may be the most anticlimactic moment of the build. The Husky parts bolted right on and fit perfectly. I spent another two hours mounting the new Avons on the rims, managing to pinch only one tube. As much I as I enjoy having my own tire machine, I’m honestly not sure if I have saved any money mounting my own tires, as many tubes as I’ve pinched. Tires mounted, the chassis is now a rolling thing. My fears of problematic ground clearance were confirmed, so I’m going to have to move the engine up higher in the chassis. That’ll force a higher fuel tank mount, and leave me to come up with a creative solution for foot pegs. I spent the rest of my allotted SnoMoChop build time tack welding plates in the bottom of the frame, giving me a flat base to work from to mount the engine. I’m currently awaiting arrival of some bearings and mockup tools from Idaho. When those get here, I’ll be able to solidify my engine/jackshaft locations and relationship. 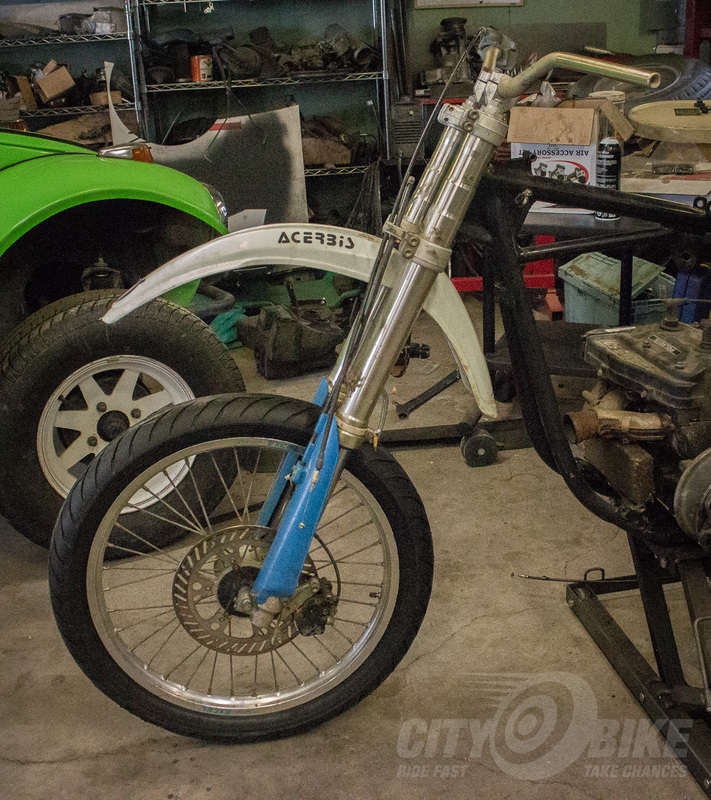 I’ve yet to solidify a seat or rear fender, both of which will affect placement of the other. I’m still scouring Craigslist for a rear brake caliper and fuel tank, and also researching a left side rear hydraulic master cylinder to actuate the future rear brake. The coming days will be hectic, and may mean more shopping than building, but hopefully I’ll be back with some substantial progress on Project SnoMoChop.